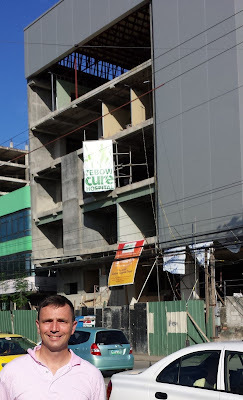 I first wrote about the orthopedic children's hospital Tim Tebow is building with CURE International in Davao City, Philippines back in November 2011. At the time the building was still in the planning stages. Well, due to some intrepid reporting by our man-on-the-street (me) and his photographer (Mrs. Jailer), with an assist from the in-laws, I can confirm that the building is indeed taking shape. Construction of the Tebow Cure Hospital started in May of last year. It is scheduled for a soft opening in the first quarter of 2014, with 17 beds, eight in the charity ward ready for patients, says Leron Lehman who will serve as its executive director. He said revenue from the private wards will bolster services for indigent children. At the start, the hospital will employ up to 45 local medical and support professionals trained in modern health-care techniques. Pennsylvania-based, Cure International focuses on providing medical care for the world’s children with orthopedic challenges, like cleft lip and palate, clubfoot and other crippling deformities. The Tebow Cure hospital will be its first in the Philippines and 11th worldwide. The top floor of the Davao facility will house a Timmy’s Playroom “to enable children to be children,” says Lehman. It will also provide the youngsters religious and spiritual nourishment before and after they go under the knife. Well, that's some pretty good reporting by Percy D. Della of the Philippine Daily Inquirer from back in March. But who scooped you on the July update (*ahem* that is to say, who got his wife to take a picture on his Samsung Galaxy S4 standing on the side of the road)? Two thumbs pointing at this guy, that's who! Addendum: Here's the video to Timmy's Playroom. Forget Tebow for a second ... how well-spoken is the kid in this clip?